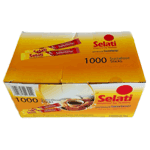 Selati Sucralose Sweeteners 1000 Sachets x 0.9g. Consumers can enjoy sugar sweetness without sugar calories. It contains sucralose and is aspartame free. Perfect for Lodges, Hotels and Catering establishments.